Do you think you could put instructions in better detail? 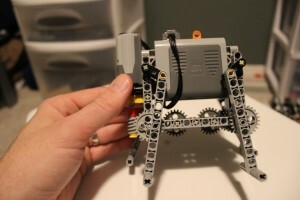 This is a great project, Can you please explain how the motor is mounted and what pieces you use? 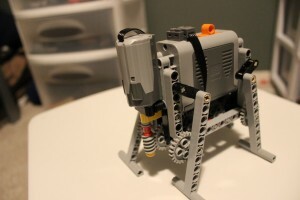 Basically I just mounted the motor so it was pointing down with a worm screw on the end. 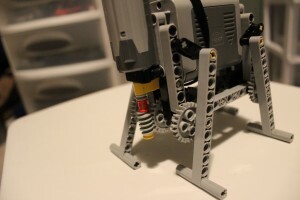 All the gears down the center of the underside are adjacent, so the worm screw drives one gear and makes everything move. 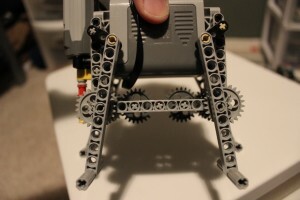 Then there’s a gear hooked to each leg sharing an axle with a gear in the center. 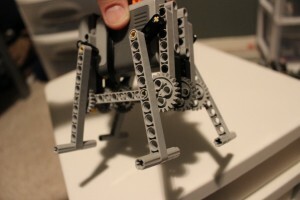 Note that the gears hooked to the legs are hooked off center — this is what makes the legs go up and down. 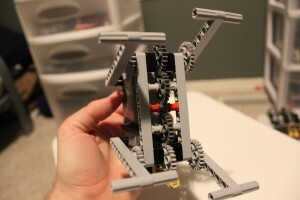 There are many ways you can make this, so I’m just trying to give you a general idea of how it works. Thank you, i have done this walker thanks of your photos and video.